An internet connection is required to play this game. 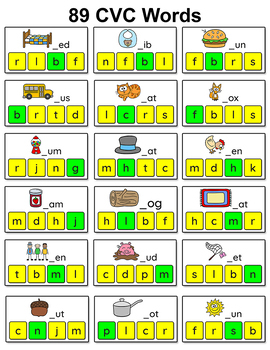 Practice beginning sounds for 89 CVC words with this fun and engaging team based phonics game for all interactive whiteboards (SMARTBoard, Promethean, Mimio), tablets and computer stations. A random team is chosen to go first. 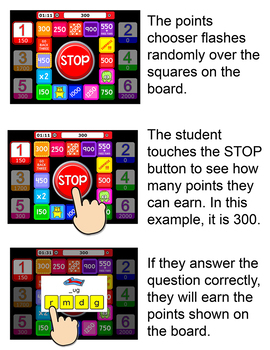 A student presses the STOP button to see what point value they can earn if they get the question correct. Watch out for the monster squares or the team may lose their points! Students will have a blast trying to get the high scoring squares and avoid the monsters and won’t even realize they are learning! This game includes 89 CVC words. Choose the exact words that you would like your students to practice with the option to save game settings so that you can quickly jump into a game without any setup. This game runs directly from the pinkcatgames.com website. The website was created so that you can easily play and manage your Pink Cat Games. 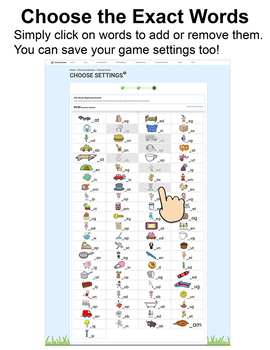 The website also allows you to easily save game settings with the option to assign games to students and groups. The first time that you visit the website you will be asked to create an account to manage your games. The following browsers are supported: Chrome, Firefox, Microsoft Edge, and Safari. Choose up to 6 teams or players. Teams take turns answering questions to earn the points shown on the board. The team with the highest score when the time runs out, wins. 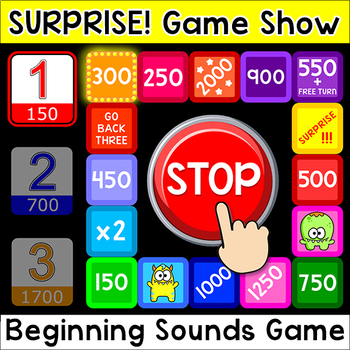 Start the game on a computer or tablet and allow the student(s) to play for a certain length of time. Tablets and computers can remain logged in to the student view so that students can easily pick their group or student picture and play a game. bat, bag, bed, beg, bib, big, bin, box, bud, bun, bus, bug, cab, can, cap, cat, cot, cub, cup, cut, den, dog, fed, fig, fin, fix, fox, gum, ham, hat, hem, hen, hip, hop, hot, hug, hut, jam, jar, jet, jug, key, leg, log, mad, map, mat, men, mix, mop, mud, mug, map, net, nun, nut, pan, peg, pen, pet, pig, pin, pit, pod, pot, pup, rag, red, rib, rob, rod, rug, run, sad, sob, sun, sap, top, tub, tug, van, web, wed, wet, wig, win, yak, yam, zip. AMAZING DEAL! With my One Year Digital Games Subscription you will have access to all of the games on the pinkcatgames.com website!